Please save the date for a Portland-based Ride of Silence in Arbor Lodge to recognize neighbors, families and friends who have been injured or killed while riding bicycles on Wednesday, May 17. Participants of all abilities are invited to join the procession. We have designed the route specifically to avoid busy crossings and intersections in order for it to be more accessible to all riders. The event starts at 6:30PM at the southeast corner of Arbor Lodge Park (N Delaware and Dekum). A brief ceremony remembering family and loved-ones who lost their lives while riding their bicycle will be held, followed by ride protocol and safety instructions. The ride will return to Arbor Lodge Park around 7:30PM. The ride will not exceed 12 m.p.h. Here's a link to our Facebook Event Page - join and share with friends and family. We hope to see you there! If you're interested in helping to organize, spread the word, find a place for us to gather for food/drinks afterward, please let us know! We are riding in recognition of Brian Duncan, who was struck on his bicycle by a person driving a car while in a marked and lit crosswalk at the intersection of North Delaware and Rosa Parks on March 30, 2016. Brian, an active member of the Arbor Lodge Neighborhood Association, loving husband and father of a three-year-old recently returned from several months of rehab recovering from paralysis in all but his left arm. • Black and/or red shirts, ribbons, arm bands, etc. Wear black to honor a cyclist who was killed, and red for one that was injured by a motorist. The Ride of Silence (now in its fourteenth year) will begin in North America and continue to roll across the globe. 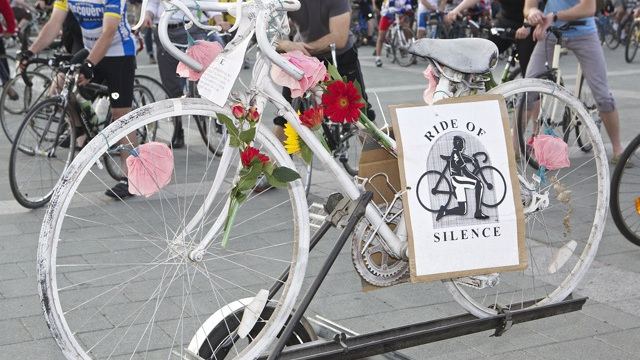 Cyclists will take to the roads in a slow, silent procession to honor cyclists who have been killed or injured while cycling on public roadways. Although cyclists have a legal right to Share the Road with motorists, the motoring public often isn't aware of these rights, and sometimes not aware of the cyclists themselves. The Ride of Silence is a free ride that asks its cyclists to ride no faster than 12 mph and remain silent during the ride. The Ride, which is held during National Bike Safety Month and Week, aims to raise the awareness of motorists, police and city officials that cyclists have a legal right to the public roadways.